"In the future, perhaps our time will be known as the first decade of the Bicycle Wars, with righteous armies fighting over traffic lanes, bike paths and sidewalks, indeed over the very purpose of the streets themselves. Like many wars, it’s a question of territory, and the pedestrian has been losing for years." “Bike lanes sure to cause division” screamed the May 17 front page headline in the Vancouver Sun (online, it was later amended to a less inflammatory “Vancouver bike lanes set to expand with Commercial Drive, Point Grey Road under consideration." The same day, the lead editorial in The Province was titled “Idiotic cyclists are the bulk of the problem." And what caused this outrage? Suggestions by City of Vancouver transportation director Jerry Dobrovolny that parts of Commercial Drive, Point Grey Road and Cornwall Avenue might be adjusted to include bike lanes. Predictably, the stories led to online flame wars between cyclists and motorists. The Sun story attracted 124 comments, most of them very, very angry and a good many of them using CAPITAL LETTERS and exclamation marks (!!!) to make their point about gas-guzzling drivers or smug self-righteous cyclists. You could keep a Vancouver apartment warm for the winter with the heat generated by the commentators. Meanwhile, lost in the anger and outrage was the news that the City was twinning a pedestrian trail along 58th Avenue, building new raised pedestrian crosswalks, and pedestrian bulges, and continuing to replace flashing “Don’t Walk” signals with countdown indicators. 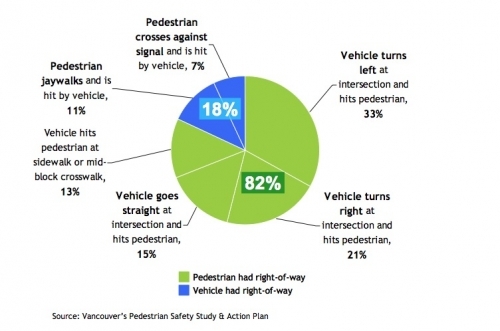 Also lost in the commotion was a City report that noted that the vast majority (82 per cent) of accidents involving pedestrians happen when pedestrians have the right of way. It’s ironic that walking is so neglected. After all, it’s the most environmentally friendly mode of transportation (even bicycles use up resources when they’re manufactured) and the most ubiquitous. As the City’s recent Pedestrian Safety Study and Action Plan -- which revealed the information about the cause of pedestrian accidents -- notes, “Walking is the most fundamental form of transportation. Walking is part of every trip, whether that trip is made by car, transit, or bicycle.” Sooner or later, even the most inveterate driver or die-hard cyclist is going to have to emerge from their vehicle or dismount from their bicycle and walk to their ultimate destination. Maybe its very ubiquity is one reason why pedestrian issues are ignored. Walking -- for those of us who are able-bodied at least -- is as natural as breathing and it can be just as mundane. It doesn’t require fancy clothes or expensive equipment. 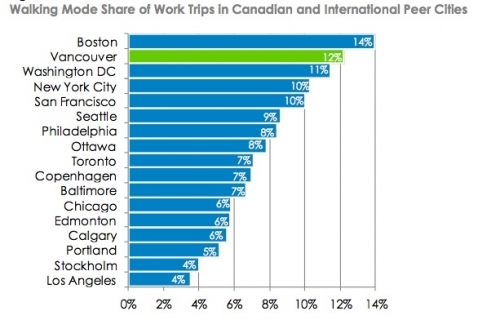 Vancouverites walk a lot -- 12 per cent of work-related commuting involves walking, the second-highest rate in North America, according to the City report. Another change has been the transformation of the City’s Bicycle Advisory Committee into the Active Transportation Policy Council, reflecting the realization that walking -- the most environmentally friendly mode of transportation -- needs to be encouraged. John Whistler is a director of the West End Residents Association and a members of the active transportation council. 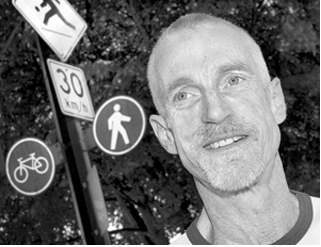 He has been pressing for improvements to walking and cycling infrastructure for years, both in his West End neighbourhood and throughout Vancouver. He’s optimistic the council can effect real change. 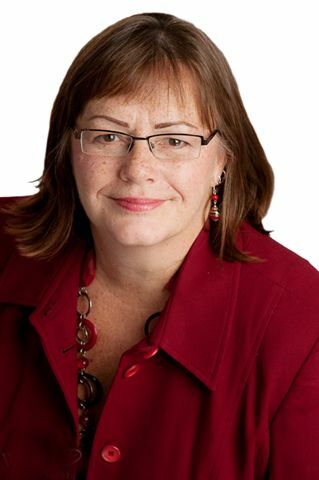 Whistler’s own ideas (which he stresses are not necessarily shared by other members of the council) include reclaiming parking space for active transportation or greening projects such as community gardens, and a blurring of sidewalks and roads, especially in laneways, which are shared by motor vehicles, bicycles and pedestrians. Active transportation advocate John Whistler (Photo courtesy West End Residents Association). Whistler’s idea to lower speed limits is controversial. When Toronto’s medical officer suggested a similar limit in that city recently, the comments both from public officials (Toronto City Councillor Doug Ford called it “nuts, nuts, nuts”) and the general public was blistering. “Lev (Linda’s yongest son) and I narrowly missed being struck by a car when we were crossing at the four way intersection by my house at 10th and Ash. The car ran the stop sign. I know, because Eli (Linda’s older son) witnessed the whole thing a few steps behind us. He wanted to yell a warning but actually lost the ability to yell in the moment he was so terrified as the car barreled towards us. Her near miss and similar incidents make for heated conversations about conflicts between different modes of transportation. Any time there’s a news report about an accident involving a car and a cyclist or a car and a walker, a vociferous online debate begins with hundreds of comments condemning all motorists, or all pedestrians or all cyclists in passionate, often vitriolic tones. Motorists are reckless maniacs, pedestrians are careless airheads, cyclists are self-righteous scofflaws (see The Onion for a skewered, only slightly exaggerated look at these generalizations. Slate magazine’s Tom Vanderbilt takes a more serious approach in “Why Don’t Americans Walk More”). He hopes the active transportation council’s new promotion and partnership committee can help improve relationships among pedestrians, cyclists and motorists. Deal certainly hopes so. She points out that we're all human and sometimes we do foolish things. We’re forgetful. We’re careless. We’re distracted. Neither drivers, pedestrians nor cyclists have a monopoly on virtue -- or stupidity. That’s why the City’s report is so welcome. It provides actual evidence about the causes of accidents and conflicts, along with recommendations to lessen the conflict between cars, walkers and cyclists and to make us more aware of each other and our mutual fragility.